This hill is a small rise on the plateau east of Commanare Lakes. Previously Banoge North N Top in MV. 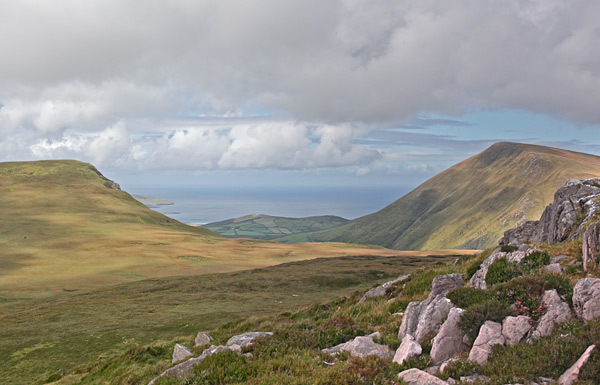 Cnoc na Bánóige N Top is the 738th highest place in Ireland. Picture from group : Low hill on wild plateau with great views. Picture: Low hill on wild plateau with great views. Its the low shadowed hill to the right of the big one. Park at Ballyduff graveyard, Q54076 10104 A A, room for 10 cars. Walk back towards the R560 from the graveyard and turn right. 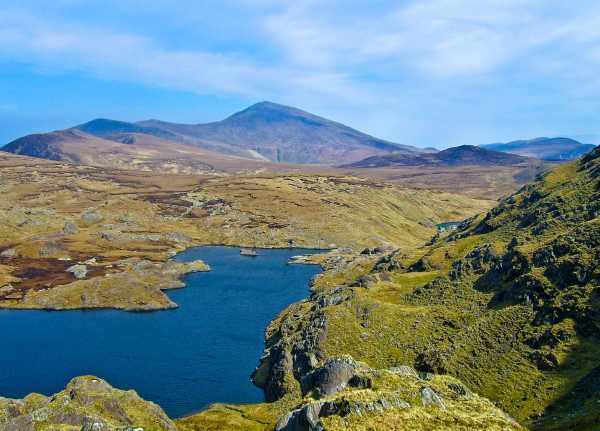 Walk around 500m along the road and cross the bridge over the Glennahoo River. Take care while walking along the R560 as it is a busy road with no verges. After crossing the bridge, continue along the R560 for another 300m. Leave the R560 and turn right into a track at Q5460010350 B B. There is an old farmhouse with dormer windows and a sloped flat roof extension at the track entrance. Continue south-eastward for around 150m along this track to reach a T-junction. Turn right there and follow a lane southwards to Maghanaboe at the head of the valley. The Glennahoo River twists and turns along the valley floor to the right. The narrow valley, some 3km long, is flanked by a sweep of steep slopes clothed with banks of scree. Crossing the wet ground before climbing the low ridge of Cnoc na Bánóige N Top. Note: We no longer recommend going on the ridge immediately south of the graveyard because of access issues. Picture from simon3 : View north of Banogue N, North Top. Picture: View north of Banogue N, North Top. Low, easily reached, with good views. See Beenbo for the last section of this walk. Cnoc na Banoge North N Top is on the middle of a mini ridge in the middle of some rough bog. Interestingly on our way here from Beenbo, we spotted several Way Marked Way marker posts for a walking trail, spacing a bit far apart for comfort in foul weather in the middle of a bog though! From here we descended to the col between the summit and point 383, before gradually descending to met the Garrivagh River, following the river to the track and back down to the car park.